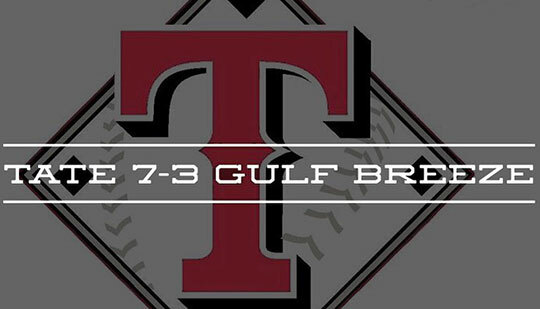 The Tate High Freshmen beat Gulf Breeze 7-3 Wednesday night to improvie to 9-0-1 on the season. Conner Wright pitched the win, going four innings, allowing one run on two hits and striking out five. Chase Lombardo came in for the save. Tucker Griffin, Dagan Guy and Warren Henke each had a couple of hits to lead Tate at bat. The Tate Freshmen will be in action next Monday in a home game against Navarre. Northview will play at Baker on Tuesday, April 23, and Baker will be a Northview on Thursday, April 25. Both games are at 6 p.m. and are varsity only.